Distribution: The Little Brown Bat is found from Labrador west to central Alaska and south to the Appalachians in Georgia and Arkansas. Located in most states except Florida, Texas, and southern California. The little brown bat was found abundantly throughout New Hampshire until about 2010, but the entire population is now at great risk from White-nose Syndrome. Description: The little brown bat is a small mammal with a body length of 2 1/2 - 4" and weighing approximately 1/8 to 1/2 an ounce. The wingspan of little brown bats range from 9 - 11". Bats are the only mammals that engage in truly active flight. As their name suggests they are glossy brown above with a lighter gray color below. These bats can live 20 to 30 years. 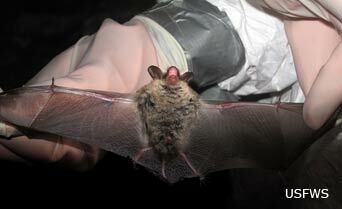 Commonly Confused Species: Big brown bat in buildings and most other bats in flight. Habitat: Little brown bats feed primarily over wetlands and other still water where insects are abundant. They use rivers, streams, and trails as travel corridors to navigate across the landscape. Bats will occasionally swoop down close to mammals to indulge on the insects that swarm around them. They can follow the same flight pattern each night as they search for food. They will prefer summer roosts close to water. Little brown bats roost in the summer in buildings (barns, attics, outbuildings) with the males and females roosting apart. The females gather into maternity colonies. They prefer hot spaces, such as right under the roof. The increased heat from the roof and multiple bat bodies helps the pups to grow faster. Males roost in smaller colonies, and may use tree cavities as well as buildings. All can use bat houses, but the females will seek out larger and hotter houses. 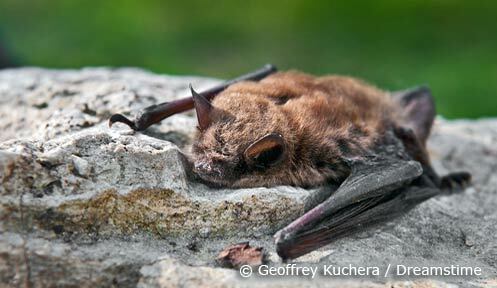 In the winter, little brown bats hibernate in clusters, in mines in NH and caves and mines in Vermont, Massachusetts and New York. There are not enough mines with the proper temperatures and humidity here in NH for all our summer bats, so most fly out of state to hibernate. In order to minimize evaporative losses the humidity in these hibernation areas must be high, preferably over 90%. A constant temperature of 40 degrees F is desirable for hibernation. These conditions are also prime for the fungus, Geomyces destructans, that is the main agent in white-nose syndrome, which is killing hundreds of thousands of bats. Life History: Little brown bats are insectivorous, eating a variety of insects such as moths, wasps, beetles, gnats, mosquitoes, midges and mayflies. They can eat 50% of their own body weight each evening. Pregnant females and those with pups eat even more insects. These nocturnal mammals use echolocation to navigate and locate prey. They send out signals and listen for those signals to return, with sensitive hearing and huge ears to help them pinpoint the prey. They swoop and catch them in their mouths, but can use their wing and tail membranes to help as needed. Sexual maturity is reached in 6 to 9 months for females and a year for males. Breeding occurs from September to October but the female stores the sperm for fertilization in the spring. The young are born from mid-June to early July. Little brown bats generally have one offspring per year, rarely two. The young become self-supporting within a month.